The Nigeria Football Federation has expressed deep shock at the death, in the early hours of Wednesday, of former Super Eagles Captain and Coach, Stephen Okechukwu Keshi. NFF President Amaju Pinnick was too shocked for words: “This is devastating. We have lost a superhero.” Other Nff executives also had something to say. 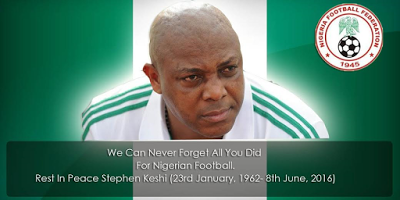 The Nigeria Football Federation has expressed deep shock at the death, in the early hours of Wednesday, of former Super Eagles Captain and Coach, Stephen Okechukwu Keshi. NFF President Amaju Pinnick was too shocked for words: “This is devastating. We have lost a superhero.” Other Nff executives also had something to say. Pinnick confirmed he had been in contact with the family and would lead a delegation of some NFF Board and Congress members to Benin City on Thursday. Pinnick has directed that all centres hosting matches of the Nigeria Professional Football League on Wednesday should observe one –minute silence before kick –off. The NFF has already informed the Confederation of African Football and the world body, FIFA about the passing of the legend. Keshi won the Africa Cup of Nations as a player and as a Coach. The only person to achieve similar feat was Egyptian Mahmoud el-Gohary, who is also of blessed memory. Only eight days ago, the legend had put a call through to the Super Eagles’ camp in Luxembourg, during which he spoke to interim Head Coach Salisu Yusuf and wished him well in the job. The Eagles went on to beat the Red Lions 3-1. Yusuf was one of Keshi’s assistants when he coached Nigeria between November 2011 and June 2015. His death came only five days short of a year to his last match with the Eagles – a 2-0 defeat of Chad in an Africa Cup of Nations qualifying match in Kaduna. Nicknamed ‘Big Boss’, Keshi captained Nigeria between 1983 and 1994, during which he won the Africa Cup of Nations gold, silver and bronze, and led the country to qualify for its first FIFA World Cup finals. He captained the Eagles at that first FIFA World Cup in USA in 1994, months after also leading the team to win the Africa Cup of Nations for Nigeria for the first time on away soil (Tunisia). Keshi was assistant to Dutchman Johannes Bonfrere as the Super Eagles finished as runners –up in the Africa Cup of Nations in 2000, and then became the first Nigerian to lead the Eagles to Cup of Nations glory at the 2013 finals in South Africa. In his 44 months in charge of the Super Eagles, Keshi won the Africa Cup of Nations, qualified the team for the FIFA World Cup finals, led the team at the FIFA Confederations Cup and steered the team to the Round of 16 at the FIFA World Cup. Before that, he had received global applause after leading tiny Togo to reach their first FIFA World Cup, in 2006. He also coached the senior team of Mali. A colourful playing career took Keshi to ACB FC of Lagos and NNB of Benin (Nigeria), Stade Abidjan and Africa Sports (Cote d’Ivoire), Lokeren, Anderlecht and Molenbeek (Belgium), Strasbourg (France), Jaguar Bay, San Jose and Sacramento Scorpions (USA) and Perlis of Malaysia. He represented Nigeria at both junior and senior levels, winning 64 senior caps. His first match for the senior team was against Upper Volta (now Burkina Faso) on July 18, 1981 and his last was the FIFA World Cup clash with Greece in the USA on June 30, 1994. He will be remembered for, among other things, giving home –based players ample opportunity to compete for shirts in the Super Eagles. He was rewarded for this when home –boy Sunday Mba scored two crucial goals as Nigeria won the Cup of Nations in South Africa, including the only goal of the final match against Burkina Faso. The late Stephen Keshi is survived by four children.